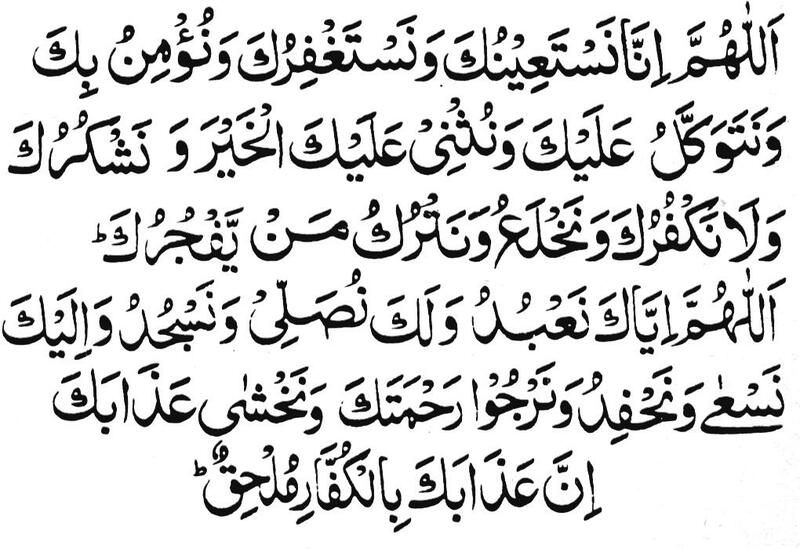 Dua-e-Qunoot is recited in witr prayer after offering 4 Farz Isha, 2 Rakat Sunnat Isha, 2 Rakat Nafil Isha as our Beloved Holy Prophet (PBUH) used to read dua Qunoot in witr namaz regularly. Islamic dua qanoot in Urdu tarjuma masnoon wazaif Arabic prayers in Islam qunut dhikr Hindi amaliyat silsila azkar e masnoona qunut tasbeeh Arabic text dua e qunoot supplication in English vitr duas audio mp3 image. O Allah! We implore you alone for help and beg forgiveness from You alone, And believe in You and rely on You, And praise You for all the good things, And we are grateful to You and not ungrateful to You, And we turn away and give up him who disobeys you. O Allah! You alone do we worship, And for You do we pray and bow before You alone, And we hasten to please You and we fear Your severe punishment, And we hope for Your Mercy and fear Your admonishment, Verily’ your severe punishment is going to overtake the unbelievers.